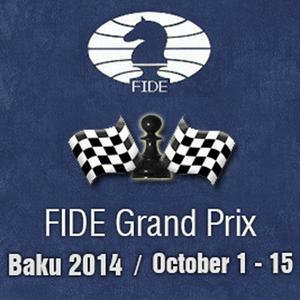 Fabiano Caruana defeated Peter Svidler in round 6 of the Grand Prix in Baku, Azerbaijan. With five rounds to go the Italian GM is topping the standings alone with 4.5/6. Boris Gelfand is trailing by half a point after drawing with Sergey Karjakin. In this round Rustam Kasimzdhanov beat Dmitry Andreikin and Teimour Radjabov won against Alexander Grischuk. After a tremendous Sinquefield Cup and a best performance on board one at the European Club Cup, Fabiano Caruana is again doing well — very well. Still undefeated since his loss against Carlsen at the Olympiad, on Wednesday the world number two moved to sole first place in Baku, and 11.7 rating points behind Magnus Carlsen in the live ratings. In round 6 Caruana won a complicated 3.f3 Grünfeld against Svidler, who played a correct piece sacrifice but then didn't follow up accurately. At the press conference it became clear that Caruana had calculated everything a bit better than his opponent. “At the start it was a bit shaky but now I'm playing at least with less mistakes. But it's still a long way in the tournament,” said Caruana. While times are good for Caruana, another player is playing well under his expected performance. Grischuk hasn't won yet, and lost his second game today as White against Radjabov. In a King's Indian-turned-Grünfeld-turned-Slav, he chose the wrong plan on move 19 and found himself in a typical middlegame position but “about five tempi down”, as he said himself. For the first time in the tournament three games ended decisively. Kasimdzhanov also scored the full point in a Philidor against Andreikin. He explained what happened in the opening: “The concept of keeping the bishop on c4 as long as possible paid off.” And indeed, that bishop could go to f1 from where it strengthened the king's position. Andreikin's opening play lacked accuracy and as a result he had to play both ...a5 and ...c5, which is far from ideal. It was “just pretty sad for Black” according to Kasimdzhanov, who found a nice tactic and then survived a desperate attack on the other side. Gelfand thought he was a bit better in the resulting ending; Karjakin thought it was about equal and therefore he avoided a move repetition. On move 31 he had seen enough. Dominguez and Mamedyarov drew a non-theoretical, Closed Ruy Lopez. Like yesterday, the Cuban missed an intermediate rook move (29.Qxd3? Rxf3! in the analysis) and this oversight allowed his opponent to equalize immediately. Not much can be said about Tomashevsky-Nakamura. Perhaps inspired by Radjabov-Caruana yesterday, the U.S. number one went for the solid Lasker Defence of the Queen's Gambit Declined. Tomashevsky's Qa3 move pinning the black c-pawn, which also appeared in the famous sixth match game of Fischer-Spassky in 1972, wasn't too dangerous this time and with accurate play Nakamura completely equalized the position.